Malala Yousafzai (muh LAH luh YU sawf za) was born July 12, 1997 In Mingora (ming GOR uh) which is the largest town in the beautiful Swat (swaht) Valley of the country of Pakistan (PAH kih STAHN). She was named after Malalai Maiwand, a heroine of Afghanistan. In Pakistan there is rejoicing when a son is born, but generally there is no rejoicing at the birth of a daughter. However, her father Ziauddin (ze ow DEEN) was very proud of his daughter from the moment she was born. They were of the ethnic group called the Pashtuns (POSH toonz ) and were a very poor family. Her grandfather, Baba, had instilled a love of education in Malala's father, and he wanted his children as well as other children to get an education. Her father began a school, but had difficulty getting it started due to the lack of finances. 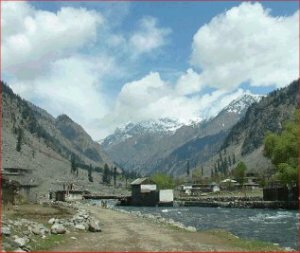 The Pashtun people had a culture of hospitality. They could not refuse guests who came to stay with them, and so many guests came to stay with him he could not afford to feed them all and have enough money to run the school. It was a hard time and eventually the school was destroyed by a flood. He started another school when Malala was born. It is said that she grew up in the school, and when she was three or four years old she was placed in a class with the older children. Her family who were Muslims observed special days such as Eid ul-Azha which commemorates Abraham's readiness to sacrifice his son Isaac. They listened to the radio broadcast to find out when to leave home because the date of the festival is determined by the phase of the moon. As she got older she said she wanted to become a doctor. Her father encouraged her to become a politician. * He said if she entered politics she would be able to bring about change where many girls could become doctors. She decided she would become a politician. The year before she was born the Taliban (TAHL uh bon) came and took over their country. They burned the girls' schools, forced the men to grow long beards, and the women to wear burqas,* garments that covered them from head to toe with only a grille in the headdress to see through. Women could not laugh and they were locked up and beaten for wearing nail polish. When Malala was a child she started stealing jewelry from her friend because she thought her friend had stolen something from her. Then she kept on stealing until her mother confronted her. Malala had to apologize to her friend and her friend's parents. She never stole anything again. One day she saw poor children scavenging* through the rubbish heap collecting cans, glass, paper, and metal in order to get money to help feed their families. She took pity on them and asked her father to give them free places in his school. The school was doing well by this time with about 800 students. He let them come to the school without their parents paying, but some of the richer parents took their children out of the school because they didn't want their children associating with the sons and daughters of the people who cleaned their houses and sewed their clothes. Malala decided to appeal to God for help for the children. She wrote a letter to Him but didn't know how to get it to Him. First she buried it in the garden, then she rolled it up and tied it to a piece of wood, placed a flower on top of it and placed it in the stream. She felt sure God would find it there. There were repeated attempts by the government officials to close the girls' school, but they continued to keep the school open. The terrorist attack that occurred in New York City on September 11, 2001 changed Malala's world because everyone suffered when the search for the Taliban* began. On October 8, 2005 there was a very large earthquake in the region. More than 73,000 people were killed and 128,000 were injured. 3 and 1/2 million people lost their homes and 6400 schools were destroyed. The Americans were able to send in aid quickly because they already had troops and equipment in Afghanistan. Some of the Islamic groups that came to help after the earthquake were the militant groups. Because many children lost both their parents in the quake and had become orphans, the soldiers took the boys and trained them to be terrorists. The mullahs* told the people if they didn't introduce sharia* or Islamic law more punishment would come. 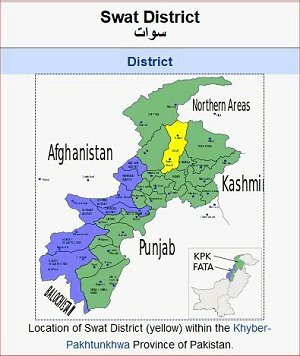 An Islamic leader named Fazlullah came to the valley. Within 6 months they had people getting rid of their TVs and CDs, burning them in the streets. Women were threatened if they left their houses and people were whipped in the open areas for everyone to see. The Taliban destroyed the Buddhist statues. If they heard children laughing and playing a game, they came in and smashed the game boards. Fazlullah said the girls should not be going to school and he began blowing up the schools and destroying them. Malala's father said if nobody spoke up, nothing would change. Malala, even though she was a child, began to speak up and give interviews. She wondered, "If one man Fazlullah, can destroy everything, why can't one girl change it?" She and her father appeared on television shows to speak out about the injustices that were occurring. She began to blog on the BBC Urdu* website, not using her own name, but calling herself Gul Makai. She wrote about her school. Then the Taliban told them the girls could no longer go to school. They set up sharia courts. The policemen feared for their lives and deserted their jobs. Some people when fleeing the country had to go to tent refugee camps. Fortunately, Malala and her family were able to stay with relatives. It was the biggest exodus in Pashtun history. After 3 months they returned to their village, but their house was ruined because it had been occupied by soldiers while they were away. In July 2010 the floods came and destroyed houses and crops. Fourteen million people were affected and 7000 schools were destroyed. Osama bin Laden was killed in Pakistan and the people were astonished that he had been hiding in their country for years without being detected. In October 2011 Malala was one of five people nominated for the Children's Peace Prize. She didn't win, but she did get a prize of half a million rupees,* about $4500. Her mother feared all the attention she was getting would make her a target for the Taliban. They soon learned threats were being made on her life because she was so brave to speak out. Malala said she didn't worry about the threats. She said, "Everyone knows they will have to die one day. Nobody can stop death, it doesn't matter if it comes from a Talib or cancer. So I should do whatever I want to do." But then she began having bad dreams and she became afraid. She checked the locks after everyone had gone to bed. She prayed to God for protection. October 9, 2012. Malala and her classmates were riding the bus home. Two young men stepped out on the road and stopped the van. They asked, "Who is Malala." 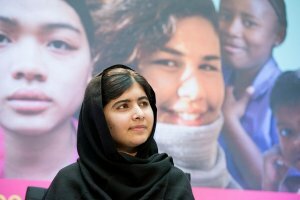 No one answered, but the other girls looked at Malala and the gunmen shot her in the head. She was badly wounded and they rushed her to the hospital. Two other girls had been shot, but were not as badly hurt. The doctor operated on her and removed bone fragments from her brain. Her brain started swelling. She developed an infection and they thought she was going to die. She needed to go to a different hospital. They airlifted her to Queen Elizabeth Hospital in Birmingham, England. Her parents were unable to accompany her because only her father had the proper travel documents such as passport and visa. Her father, Ziaudden, gave the doctor temporary guardianship to accompany his daughter to the Birmingham Hospital. In the hospital she slowly recovered. The bullet had affected the left side of her face. It had damaged her eye, her left ear, and because her face was paralyzed she could no longer make her lips form a smile. She was confused and couldn't speak. She worried that her parents wouldn't be able to pay the hospital bill. She was told the Pakistani government would pay for all the expenses. Finally her family was able to come to her. When she saw them she cried for the first time since the attack had occurred. Prayers and cards were sent from all over the world. She received 8000 get-well cards and many stuffed toys. Millions of children had prayed for her recovery. She was discharged from the hospital in early January 2013. The family was not able to return to Pakistan, but remain in England. By April she was able to start school in Birmingham. The authorities in Pakistan who oversee the private schools have banned Malala's book and will not let the students read it because they say it has passages which are anti-Pakistan and anti-Islam. Earlier Malala had wondered if one girl could bring about change. On her sixteenth birthday she was in New York and spoke to the United Nations. Yes! One girl can bring about a world of change! You can listen to her speech on the YouTube below. In 2014 Malala, was awarded the Nobel Peace Prize for her efforts to promote education for girls. She was the youngest person ever to be awarded the prize. She shared the honor with Kailash Satyarthi, a children's rights activist from India. 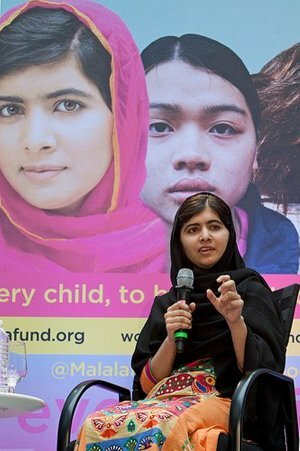 Two weeks later Malala was also honored in Philadelphia when she received the Liberty Medal. This biography by Patsy Stevens, a retired teacher, was written November 13, 2013. This page displayed 41,350 times.